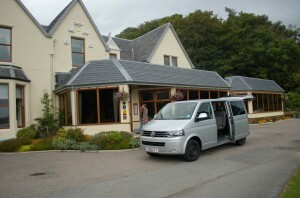 Driver guided tours are tailor made tours for small parties. These tours are normally couples, families or very small groups wishing a more personal service. Tours can be of variable length from half a day to more than one week. As the vehicles used for driver guided tours are smaller than coaches they can often visit places missed by larger tours. 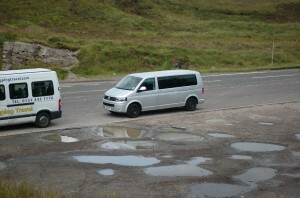 An appropriate vehicle is supplied (usually a VW Transporter or Mercedes Benz Vito) which allows tours to venture all over Scotland without restriction. The vehicle will have up to 8 seats and plenty of luggage space.